Today I'm joining the link party over at Centsational Girl where you're invited to share favorite things about where you live! I'm originally from New Jersey and my husband's a native of Philadelphia. Although we've lived in Georgia since 1998, my family and I recently moved to the metro-Atlanta area in 2007. Atlanta's a beautiful city. It's clean and very diverse. There's a lot to see and do. Little Creek Horse Farm- Atlanta's only public horse farm. You can enjoy access to the farm, pony rides and riding demonstrations. Cagle's Family Farm is just a short drive away from anyone living in the metro-Atlanta area! They offer farm and dairy tours. During the Fall, they have a giant maze and a pumpkin patch. I love the zoo! Zoo Atlanta is a great way to spend an afternoon. Mountain Park Aquatic Center- so much more than I expected from a public pool! It's a fantastic place to visit. Turner Field- A great place for Baseball lovers. The High Museum of Art- The special exhibits are amazing. Fox Theatre- A marvelous place for concerts and plays. A beautiful building with a lot of Atlanta history. I didn't see Larry The Cable Guy, although I hear he puts on a great show. His show happened to be displayed on the marquee at the time of my visit. Centennial Olympic Park, Located across from the Georgia Aquarium and the CNN Center. My family enjoys walking through the park. The Olympic Rings fountain is great fun during the summer as well as the ice-skating rink in the winter. Overall, the park is a nice place to visit. The Center is a fantastic tribute to an amazing man. You can visit Dr. King's birthplace as well as Ebenezer Baptist Church nearby. Stone Mountain Park- I love bringing my children here. We always enjoy ourselves. The best part about Stone Mountain is the trek up the mountain. Although I do not recommend walking up a steep mountain at night, in the rain! Winter activities include Snow Mountain. It’s fun for those of us who don’t normally get to play in the snow. There are lots of different activities from tubing to building snowmen! Atlanta is full of great places to eat. Copeland's on Barrett Pkwy. never disappoints. Their menu is delicious. Their bananas foster cheesecake is to die for! Dekalb Farmers Market- was one of the reasons we moved to this area. Food from everywhere! I was blown away by the variety and prices found here: meat, seafood, deli, bakery, wine, groceries, flowers, and aisle after aisle of fresh produce. This place is amazing! Hope you enjoyed my tour! PS. All photos are mine, except for the last one. My parents retired to the Atlanta area from up here in NY. Now I have some new places to put on my must visit list the next time we're down in GA. Thanks for sharing. I have only been in Atlanta one time when I wasn't at the airport and that trip took me on a shuttle from the airport to the Hilton and back again the next morning because my flight was canceled. I have always wanted to visit except in the summer. Too hot for me! I really enjoyed the tour, Brandi. I want to go to that Farmer's Market. Bad! I'm loving your post. We took our boys to the aquarium in Atlanta a few months ago and they loved it! Next time we want to do Stone Mountain. My husband was there as a kid and wants to share his memories with our kids. I love Stone Mountain, and the laser show is fun too! Atlanta is a great city!!! I was raised in metro Atlanta, love it. Miss living there and all the highlights you posted about!! Wow Brandi, there are so many great things to do in Atlanta. Thanks so much for the fun and informative tour I really enjoyed it. Atlanta is so fun! We love Atlanta! In a few years, we would love to move there. Thanks to you I'll be putting some more fun things to do on our list when we come to Atlanta. Thanks for the tour Brandi. Looks like a fun place, and of course the food pic made me drool. The farmers market is one of my favorite places. Love it. I also love going to stone mountain to work out. Brandi what a wonderful post. Love the tour of your town. Big Hugs!!! Wow, there are some really neat things to see there. All of my dad's family is from Georgia (Conyers, Athens, and Canton area). They are looking to take a trip there sometime around Christmas. I am sure they would love to see a few of these sights when they go! I am an Atlanta transplant as well. I've grown to like the city a lot. There are a wealth of activities for singles as well as families. Just last night at dinner we were talking about places we would like to live and ATLANTA was one of them. This was a fabulous tour. I really want to go to Dekalb Farmer's Market. Brandi, I didn't know that you live in one of my favorite cities! I love Atlanta. I would love to live there! I love the diversity of Atlanta! You guys must never get bored there. Ive always wanted to go to world Market.Thanks for sharing. That looks lovely! It's so interesting to see different parts of the world...and summed up in one post!! I was in Atlanta during the 1996 Olympics. I'd love to go back when it's not such a busy time and check out the sites! I've always heard that Atlanta was a beautiful city, but I've never been there. Thanks for this wonderful tour Brandi! Gostei de conhecer Atlanta, é linda e pareceu-me bastante divertida... obrigada pelo tour, Brandi! Beijinhos. Dang girl, how did I not know we are neighbors??? 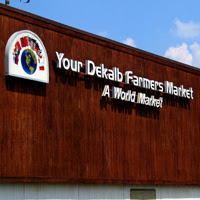 I was JUST at the Dekalb Farmers Market on Thursday! !